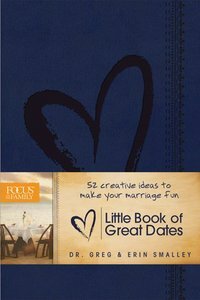 The Little Book of Great Dates will help build romance and fun into any marriage with its creative ideas for a year?s worth of weekly affordable dates. This book?a simpler, gift version of Focus on the Family?s The Date Night Challenge campaign?will help couples to proactively and intentionally build their relationship, showing how everyday activities can become ?dates? that strengthen the marriage relationship. It includes plans for special-occasion dates, such as the couple?s anniversaries (first date, engagement, wedding), birthdays, etc. Couples can get to know each other better by sharing fun times and discover dating again in their marriage with this great little book of ideas! About "Little Book of Great Dates"